So… that means this list has become impossible to complete. I have asked the cheesemonger for their recommendation of a similar cheese so I can cross this food off in spirit. So, yea… I think I need to evaluate just how many of these are things I won’t be able to eat – whether it be down to ceased production, ceased growing or an embargo on harvesting. Anyway, onto something a bit more positive. Oh, so what did you have as a late night snack whilst watching Review With Forrest McNeilI? Why, it was monkfish liver on Italian lingue crackers. Sounds a bit highfalutin, especially when I think how expensive monkfish steaks, but this tin was just over 3€ from the same website that I bought the figatellu from. Honestly, there was a bit of trepidation as I opened this can. You’d think that after eating lamb’s brain and bull testicle I would have become a bit more cavalier about things. Then again, it isn’t every day you eat fish liver. 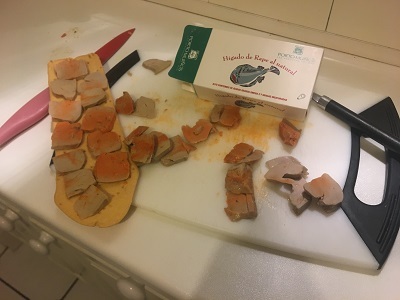 I’ve seen it written that monkfish liver is the foie gras of the sea… which isn’t the best thing to bring to mind as I didn’t think too much of foie gras. I guess that what struck me first about the monkfish liver was just how soft it was to slice, it was softer than butter. The liver itself was rich and unbelievably mild. It had a mildly briny taste and aroma which came alive when it was topped with a pinch of salt on top and when served on a lightly salted cracker. Since the hub didn’t like it too much, I had to to eat the whole thing myself. To be honest, a whole tin made me feel a little bit sick. I guess it was just a bit too rich for me to eat in large amounts.